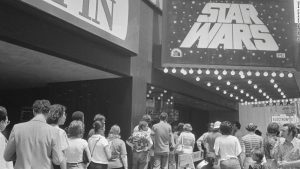 Colin Marshall writes for Open Culture about the Star Wars saga, its’ critics and the importance of the mythic journey. The article explain that though some may say that the films fall into cliches or implausibilities, George Lucas and Joseph Campbell argue that the galactic story’s power comes from its’ mythical influence and elements, which is how the film should be interpreted. It’s no coincidence that Campbell and Bill Moyers conducted the first five episodes of the PBS series “The Power of Myth” at Lucas’ Skywalker Ranch.